Written originally for Jedi365, reposted with permission. Public Service is a core responsibility of the Jedi Knight. This can take many forms as we have explored within the Five Goals of the Jedi. Training takes top priority for the Jedi as they begin the path. We touched on this before. You cannot truly help another unless you can help yourself first. You have to be in a secure place before you uplift others. Consider it like two people on the edge of a cliff. You want to help the other person get to safety, yet your footing is not secure. Do you risk both of your lives by helping the other person? Or do you make sure you get to a place that can support both of your weight and help the person get to safety then? So when you are training as a Jedi we want to encourage fulfilling the Five Goals, but in small ways. Now that you are a Jedi Knight this opens up a lot more. Your training won’t take up as much time. This doesn’t give you more time to go back to video games and novels however. It is time that can be put to use. Time to get out there and start making a difference. How? That falls to you Jedi, but it is something expected of you. Maybe you help out at a food kitchen. Maybe you help out at a local animal shelter. Maybe you volunteer at the local after-school program (music instructor, coaching a sport, homework tutoring, etc.). Find something that works for you and speaks to how you want to make an impact in the world. Environmental causes also work very well. There is something for everyone and a time schedule that works for everyone. If work, family, and training only allow a couple hours a week for it, so be it. But make an effort, it is part of your duty as a Jedi Knight. Adhering to the Core Ideals should go without saying, but here it is anyhow. Training is over apprentice, you are a Jedi Knight now. Your duty as a Jedi Knight is to adhere to the Jedi Circle. You don’t get the excuse of being a student any more. Hopefully you didn’t develop that habit of excuses. Sure, no Jedi is perfect and we do and will make mistakes. It happens, the misconception of infallibility and all that. Yet you are a Jedi Knight now. Your peers have recognized you as a competent and skilled Jedi. This means you have a deep responsibility to represent the entirety of the Jedi Way. You are fully trained and considered capable of training others to your level. This means people will look to you as the example. So adhering to our core ideals is simply a requirement at this level. Breakdown the code into its base elements. Peace, knowledge, serenity, harmony, and the Force are the main tenets you’ll want to be able to explain clearly. These are topics you want to have an intimate understanding of. How does physical, emotional, intellectual, spiritual, and social wellness play into the Jedi Path? Why is it a part of the Jedi Path? What examples within the fiction are there of these things? You are a teacher now. You understand the path and the why of it. How it applies to everyday life and the inspiration behind it. Of course this goes beyond just knowing, you must also live by them. You must promote them through your actions, not just your words. There are those looking and learning by observation and your actions will inform them of not only how a Jedi acts, but the quality of the Path itself. Mentoring and Passing on Knowledge is one of the more rewarding responsibilities of being a Jedi Knight. There can be great joy in helping to guide a young Jedi along the Path and to Knighthood. Watching a person flourish in life and seeing them exemplify the Jedi Way will bring a smile to your face every single time. Having a hand in that journey? It is a great feeling. Yet it is a task that is very challenging. It carries a lot of weight and you are effectively assuming responsibility of another person’s journey along the Path. This requires that you be ready for such a challenge. Be prepared and have a clear idea of how to approach being a mentor. Understand now that being a Jedi mentor is basically a full-time job. This is not something you get to check in on once a week for about an hour. This is not something you get to just throw assignments at and forget about. You need to play an active role in being a guide to another person. You are a role-model and it falls to you to represent that properly. Be sure you have your stuff in order before you take on this responsibility. Do not rush into anything and be sure that you take the time to fully make sure that you and your potential student are in fact compatible. This is a wonderful responsibility, but it must be approached with the right mindset. Which we will cover a bit later on. Promoting and Representing Harmony is something Jedi Knights do through the integration of personal wellness and world-betterment. It isn’t about being separate from the world or the problems and issues we face in everyday life. We are not above the constant challenges everyone faces on a daily basis. What Jedi Knights have learned is to harmonize the core ideals of the path into the daily interactions. We do not ostracize others for the sake of the path. We are not running off to some temple in the middle of nowhere hanging out with other reclusive Jedi meditating on the Force all day. This isn’t what being a Jedi Knight is about. We are not seeking enlightenment nor are we Shaolin Monks. 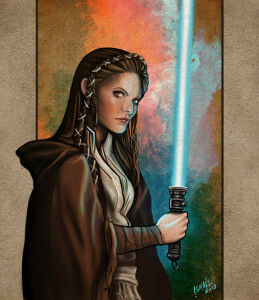 Being a Jedi is lived and honored through living the life we have. By being present and engaging with the life, friends, and family we have right in front of us. Consider what harmony means in musical terms. It is the combination of multiple tones which hopefully blend into cords that are pleasant to the ear. This is the Jedi Way. To blend the multiple ideals and practices of the Path into our daily life which hopefully produce a positive and beneficial lifestyle. As a Jedi Knight you get to be a core representation of that now. How you live your life, what you do with it, how you integrate it with other lives around you, all of this becomes your responsibility. Not only to do this, but to do it in a way that shows the validity and value of doing so. Continual Education should be of no surprise. You are a Jedi Knight! Congratulations! Now you not only get a boatload more responsibilities, but have much more to learn; aren’t you just overjoyed? One of the core ideals we spoke on before is knowledge. As a Jedi is this something that has value you to. So you will be expected to continue on with it. Now there are a variety ways of doing so. The first I’d recommend is a refresh course on mentoring and being a good role-model. As this will play into one of your new responsibilities as a Jedi Knight. Of course once you tackle that you can move on to other things. Such is current events or how to set-up a local meet-up group. How to find a good organization to volunteer your time to. Plenty of things for you to learn and continue to grow as a Jedi. New meditation techniques. Take a new workshop at a Jedi Gathering and learn a new self-defense technique. The main thing is that you continue to grow as a Jedi. Being a Jedi Knight is a recognition of the time you have put in and the growth you have shown during that time. It acknowledges that you are become a very capable Jedi that is trusted to be a valued representative of the entire Jedi Path. That you are able to pass on the Way without damaging another in the process. As you continue to live your life as a Jedi you will still be faced with challenges in life. You will still have tough moments that will test very fiber of your Jedi ideals. Many life-changing events may be in the works for you. Marriage, children, divorce, new job, loss of your career, there is absolutely a huge and very long list of things that can upset the balance and calm you have developed over the years. As you face these events new lessons will present themselves to you. You will find your practices and ideas challenged and from that you have the chance to improve and expand upon them. There is no end to your journey of learning and that is the final responsibility that falls to up to upkeep Jedi Knight.